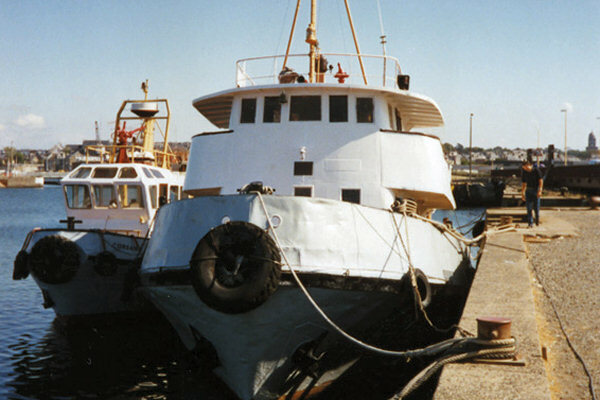 The tugboat Côte d'Emeraude was built in 1956 by the SICCNa in Saint Malo for the Chamber of Commerce and Industry. This tug was powered by a diesel engine (2tew 4cil) Sulzer type 4TD36 of 600 HP. Côte d'Emeraude will remain in service until the beginning of the 90's. Then she goes over rot at the bottom of the port pending a hypothetical restoration. she has been squatted and experienced a fire in 2001. In 2006, she was moved to another basin, presumably to put her out of sight. Finally, she was demolished in october 2014. For modelers, there has been a construction box for a 1/20th scale model. You can also find pictures of the tug Côte d'Emeraude in the Photo Gallery and other information on the site of Roger Legat and his model of the Côte d'Emeraude.